Open Up Your Mind covers the first two incredible years of Rembrandt Records, a Chicago based label. The first release in March 1966 was a bluesy garage-band novelty record titled “Boots Are Made For Talkin’ ”. It was a parody of Nancy Sinatra’s, smash hit at the time, “These Boots Are Made For Walking”. 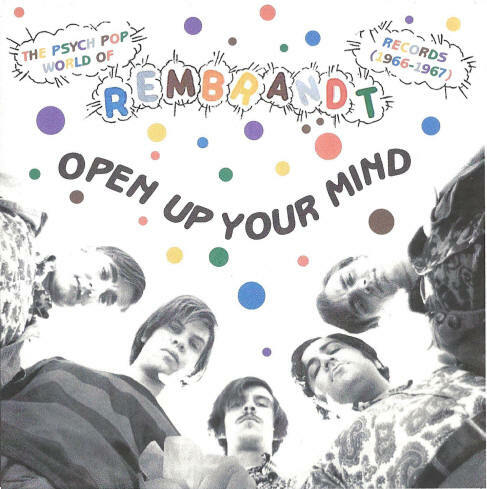 When the single failed to chart Rembrandt Records’ owner Reggie Weiss moved in a different direction, merging pop with psychedelic music, for the next single, “Open Up Your Mind”. He wrote the song based on a LSD trip and response to the single was positive. Soon other psych-pop singles were issued featuring The Circus, The Nickel Bag, and Monday’s Children. Cash Box magazine began plugging Rembrandt Records during the fall of 1966. However, Weiss was unable to secure solid distribution and could not compete with the larger Chicago based record labels such as Dunwich, USA, and Destination. By 1967, Weiss devoted all of his time promoting a high-school band called The Lemon Drops. He wrote another LSD inspired song titled “I Live In The Springtime” for the band. Unfortunately, the single was unable to chart, even regionally. Over the ensuing decades though, the reputation of The Lemon Drops, The Nuchez, The Nite-Owls and other Rembrandt artists has grown immeasurably. This compilation contains all the singles issued on Rembrandt Records from 1966-1967, plus many previously unreleased versions and mixes that are appearing for the first time ever. The twenty-two recordings on this album make it apparent that Rembrandt Records was way ahead of its time when these treasures from the psychedelic 60’s were recorded.